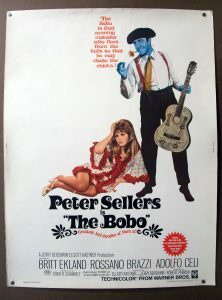 Peter Sellers stars with his then-wife, Britt Ekland, and Rosanno Brazzi in “The Bobo” from 1967. The always funny Sellers plays a singing matador named Juan, who comes to Barcelona to make his fortune. He sings for an unimpressed local impresario (Adolfo Celi), who agrees to book him on one condition. Juan has to spend an evening with Olimpia (Ekland), a flirt who gets whatever she wants from men, including apartments and sports cars, and then she drops them. Juan pretends he is the messenger of a wealthy count and works at seducing her. Anything with Sellers is good, I think, but in this period of time he was going through some kind of identity crisis. He was married to beautiful Britt Ekland and trying to change his image somewhat. The movie isn’t very good, but there is some fabulous dancing, music, and atmosphere, and chemistry between Sellers and Ekland. Sellers has funny moments as well. The film has an unexpected ending which a lot of people did not like. I thought it fit. There’s not much here, but if you want to see flamenco dancing like you’ll never see it again, see this film for the nightclub scene.